A dozen years after he captured his third world title in two different weight classes, seven since his last fight, “El Gallo” Jose Rivera returns to the ring August 17 to headline “Homecoming”, presented by Granite Chin Promotions (GCP) in association with Rivera Promotions Entertainment (RPE), at The Palladium in Worcester, Massachusetts. The 45-year-old Rivera (41-6-1, 24 KOs) has already lost more than 30 pounds, now within four pounds of his contracted weight, since he started training earlier this year. He will headline against Ruben “Modern Day Warrior” Galvan (27-26-4, 10 KOs) in the eight-round main event. In front of nearly 10,000 hometown fans in Worcester, Rivera capped his boxing career by winning a 12-round unanimous decision in 2006 over defending champion Alejandro Garcia (25-1) for the WBA World super welterweight title. “The idea to return to the ring started with my son. A.J., and I talking about chasing history,” Rivera explained. “We are not able to put that together right now (A.J. was born with Spina Bifida and he was unable to secure medical clearance in time for the Aug. 17th show. ), but because of my hard work these last six months, I felt that it was only fitting to continue with my fight. During Rivera’s title reigns, unlike other world champions, he also held a full-time job as a court officer in the Massachusetts Trial Court, a position in Worcester that he still holds 17 years later. Between working and training, never mind his family responsibilities, Jose somehow manages to balance everything in his extremely busy life. Rivera isn’t under any illusions that his comeback will lead to another major world title. The plan is for him to have two more fights to reach a total of 50 as a pro, but he’s taking things one fight at a time, and he still hopes his next fight, tentatively slated for later this year, will be on the same card as his son’s pro debut. Rivera last fought in 2011, taking an eight-round decision over Paul Mpendo, at Mohegan Sun Arena in Connecticut. 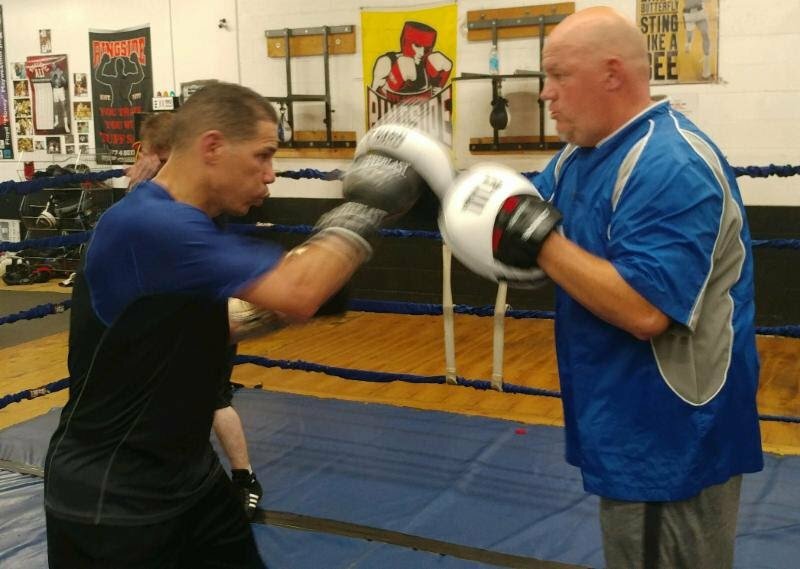 The battle-tested Galvan, his Aug. 17th opponent from Indiana, has fought other world champions, Including Zab Judah, Julio Cesar Chavez, Jr., Jorge Paez and Paul Spadafora. “Training for this fight has been more mental than anything else. I have been able to reach peak performance at 45 training like I did in my prime. The most important thing is that, working with my trainer Sean Fitzgerald, I’ve been focused on making sure my timing gets better since it’s been seven years since I last fought. The name of the event is “Homecoming” because six fighters in action are from Worcester, including three who’ve never fought there before as professionals. Middleweight Kendrick Ball, Jr. (9-1-2, 6 KOs) and junior middleweight Khiary Gray (15-4, 11 KOs), both promoted by CES Boxing, will be fighting at home in Worcester as pros for the first time in a pair of six-round bouts. Ball meets Demetrius Walker (8-21-2, 4 KOs) in the co-featured event, while Gray (15-4, 11 KOs) faces Antonio Chaves Fernandez (9-33, 4 KOs), of Brockton, MA, in a rematch of a fight won by Gray. Also scheduled to fight on the undercard in four-round bouts are Springfield, MA welterweight Jose Angel “KO” Ortiz Jose Angel “KO” Ortiz (4-13-1, 1 KO) vs. Seth Basler (0-8) and pro-debuting featherweight Joshua Orta vs. Worcester’s Edwin Rosado (1-7-1, 1 KO), Southbridge, MA welterweight Wilfredo “El Sucaro” Pagan (4-0, 2 KOs) vs. TBA, and Worcester’s pro-debuting welterweight Eslih Owusu.vs. Bryan “The Brick” Abraham (6-30-2, 6 KOs).